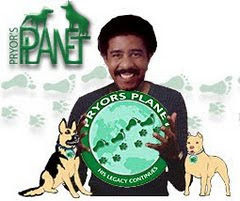 Mal-A-Boo Designs is generously giving 10% of sales to Pryor's Planet. The jewelry making design company also donates pieces to help other rescue organizations bring in funding. If you are in need of holiday gift ideas, check out Mal-A-Boo Designs and your purchase will help support our wonderful dogs who are looking for forever homes! Basil has found a home! Basil, an adorable Schnauzer Lhasa Apso mix, had been with Pryor's Planet for nearly a year. 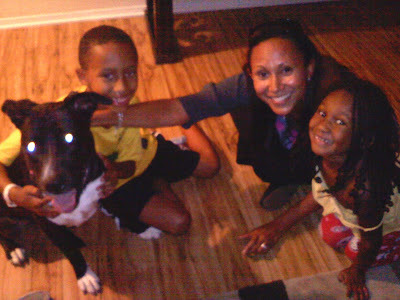 All his patient waiting paid off, and a wonderful family came along and fell in love with Basil's charm! Basil, who is now going by the name "Bennie" has adjusted wonderfully to his new permanent home. He loves his new family, and spends his days happily playing ball, running around his own yard, and cuddling up with his humans on the couch. We are so happy for Bennie and the loving family that has welcomed him into their home! PRYOR'S PLANET IS CURRENTLY IN NEED OF VOLUNTEERS FOR OUR ADOPTION EVENTS! PLEASE CONTACT US IF YOU CAN DONATE A FEW HOURS TO HELP A GREAT CAUSE!!! PARTICIPANT REGISTRATION FOR THE NEW TERM BEGINS ON SEPTEMBER 1, 2014. There is no pre-registration! This means that you cannot register for the new term until September 1, 2014 or after. 1. All of your members who are currently enrolled in the Ralphs Community Contribution Program will remain active until August 31, 2014. 6. This notice does not apply to participants of the Food 4 Less/Foods Co Community Rewards program. Our new puppy, Dodger, was found lost and alone on the street. 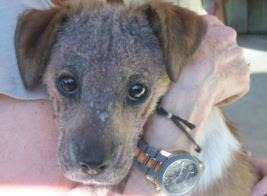 A horrible case of mange ravages his face and body. Thanks to your donations, Dodger’s mange is under control and he’s becoming healthy and happy again. But he’s still got a ways to go. So many dogs suffer the way Dodger is suffering, and your generosity can help pay for vet visits, medication, food, and home comforts. Give today, and help Dodger get one step closer to finding a forever home.